For those who were waiting for MSI’s BIG BANG motherboard on the Z77 chipset, the wait is almost over. MSI has been working lately on its latest Big Bang installment based on the Z77 chipset for both Ivy Bridge and Sandy Bridge processors on the LGA 1155 socket known as the MSI Big Bang ZPower motherboard and teased its press photos online. 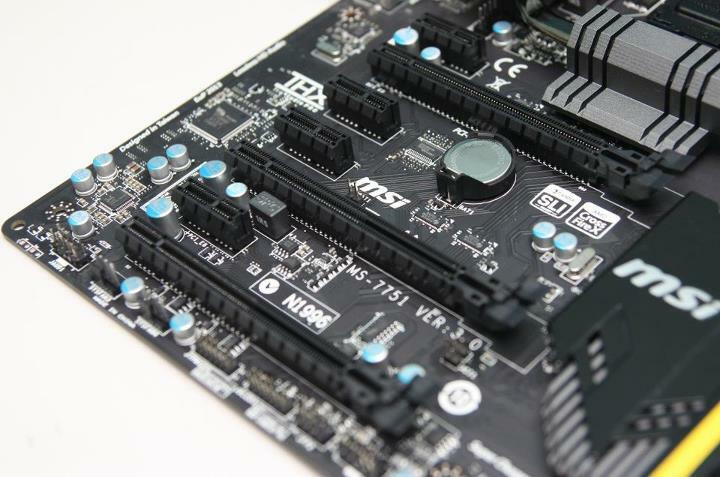 Although the name hasn’t been confirmed as of yet, the board carries the model number MS-7751 v3.0 that suggests the board has a similar PCB design as to the Z77A-GD65 motherboard. The board overall themed black seems to have a stealthy heatsink design all over that follows similar to MSI’s Lighting series graphics cards. The board on the other hand has been designed for 3 way SLI (unlike the previous Big Bang motherboard that had its PCI lanes all populated with PCI-e 16x slots) yet there wouldn’t be a PLX made bridge chip on this. On the other hand, it will use a Pericon PCIe lane switches that split the x16 links from the CPU to either x8/x8/NC or x8/x4/x4 respectively. The board is expected to come with a smoother and easier to use UEFI BIOS setup in terms of overclocking that would be friendlier to use besides beefier Military Class III components and VRMS. The board is likely to be exhibited at the Computex event starting from 5th till 9th June.